Check it out, we finally have a catalog! It may not look like much to you, but it's taken us months to put together. We had convinced ourselves that we would work on our catalog after we finished developing the next idea ... or after we took some new product shots ... or after we restocked something that sold out ... or ... you get the idea. We were building up an outdated notion that it had to be this uber final document. We were treating the catalog like our products which have to be complete and consistent, instead of like our website which is continuously updated and evolving. We're not going to a trade show tomorrow. We're not printing physical copies of the thing. No one else knows what we have or don't have up our sleeves, so no one can know what is missing from it. Yeah, it all seems so obvious now. Working on the catalog in combination with our wholesale policies and order forms has forced us to think about our production and branding and taking the next step. We have lots of ideas for the future, so hopefully our catalog will be updated and improved frequently. In the meantime, your constructive criticism is most welcome and if you're a shop interested in carry our goods, email us for those forms! 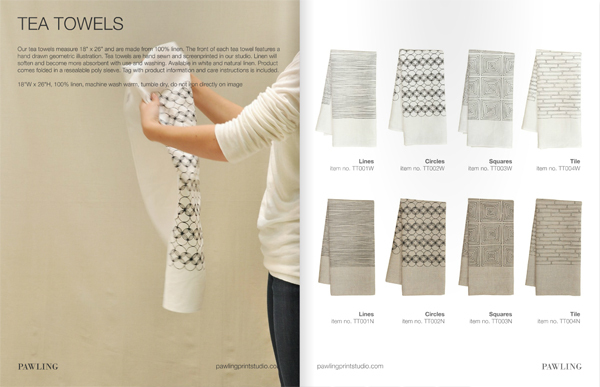 The catalog is elegantly designed, just like your product lines. It is also ecofriendly to accomodate new introductions dynamically. Well done! Congratulations for this! It's on our to do list since months to make a catalogue, but feels it will stay there forever... Daily business is just keeping us too busy for now. Great that you made it! Thank you so much Dot and Nauli! It feels so good to finally cross it off the list. looks like such a lovely catalog. my husband & i are beginning to lay out our bird alphabet book, and i can imagine it must feel much the same with a catalog -- showcasing your work, right? congrats!